The major difference between "G" and "E" is that the best of the line "G" comes with airbag, ABS, spotlight, remote key, alarm & immobiliser, six-disc in dash CD autochanger and CD Player, but "E" has neither of these. E is identical to G in all other respects. Please note that 2500 cc only has an E version. 2700cc Vigo only comes with a petrol engine. 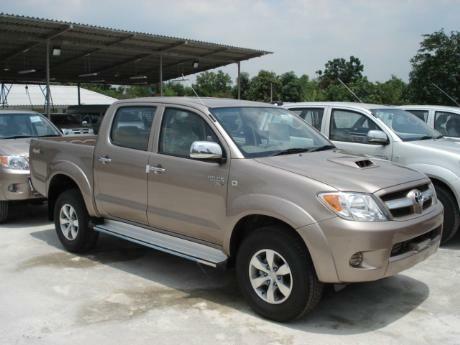 There is also a J version (see below) but there is not much demand for this vehicle. 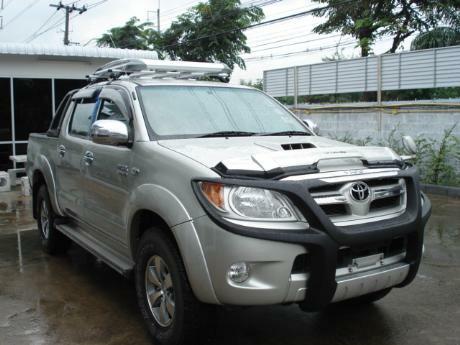 Toyota Hilux Vigo Grade "G"
ABS Brakes, Driver side Airbag, Side Impact Beams, GOA body (Global Outstanding Assessment), Collapsible steering column, Inertia fuel cutoff. Side Impact Beams, GOA body (Global Outstanding Assessment), Collapsible steering column, Inertia fuel cutoff.